Much has been said about the demise of reading, literature, books and bookstores. In the US alone between 2000 and 2007 around 1,000 independent bookstores shuttered their doors. The national chain Borders went bankrupt in 2011, closing over 600 locations. Electronic forms of entertainment, e-readers, and Amazon.com have all been highlighted as villains in the destruction of physical print and brick-and-mortar bookstores. Yet, over the last few years a somewhat surprising trend seems to have emerged. It’s not an exponential curve, such as new members flocking to social media in their gazillions, but it’s encouraging nonetheless. According to the American Booksellers Association, the number of member independent bookstores has increased more than 20 percent during the five year period from 2009 to 2014. 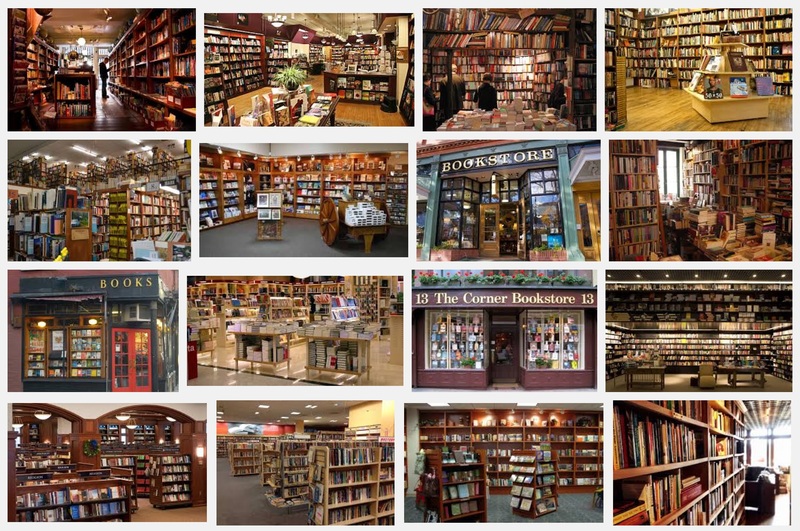 And, to add icing to the cake Amazon recently declared open a real, physical bookstore! Yes, you read the last sentence correctly — the bookstore is located in Seattle, and carries around 5,000 titles. Literary fans in Seattle will no longer need their MacBooks to procure the latest bestselling book: they just need to stroll down to the local Amazon Books store. Today, the online retailer is opening its flagship physical outlet in Seattle’s University Village. According to a press release, the selection of available titles is based on Amazon.com customer ratings, pre-orders, sales, popularity on Goodreads, and curator assessments. If you need further convincing, Amazon Books is also stocking “review cards” so as to ensure you know exactly what everyone else thought about your potential purchase. Interestingly, the books will all be displayed “face-out,” meaning that customers will be able to see the covers instead of merely the spine. The reason for this, explains Amazon Books vice president Jennifer Cast, is that the company wants to showcase the authors and their work rather than cramming as many things on a shelf as possible. The first Amazon Books store is fairly large at 5,500 square feet (510 square meters) of retail space and 2,000 square feet (185 square meters) of storage. Read the entire ars techica article here. Read the entire Slate article here. Image courtesy of Google Search. When I soak in articles like this one on Amazon’s (the dotcom) vast and ever-growing empire I wonder about the difference between ambition and greed. I used to admire this company tremendously, founded by the singularly focused Jeff Bezos. But, for some reason, when Amazon expanded into retailing groceries my allegiance began to wane. Now that they’re also producing their own entertainment programming, and have their sticky fingers in hundreds of diverse pies, I think I’m starting to dislike and distrust this corporate behemoth. Amazon gave up being a pure retailer a while ago — now they produce original shows and movies; they host e-commerce and manage business services for many other corporations; they run all manner of marketplaces; they compete with distributors. The company does all of this very well. When did Jeff Bezo’s ambition and that of his 150,000-plus employees — to deliver all manner of stuff so effortlessly and conveniently — morph into what increasingly seems like greed? Because, somewhere along this spectrum of acquisitiveness a noble ambition seems to have become a selfish one. Oh, and as for the demanding, competitive, brutish workplace — the company seems to be doing nothing more than applying the same principles to its employees as it does from its data-driven retailing and distribution operation. Unfortunately, it seems to have lost sight — as do many companies — that employees remain stubbornly human. On Monday mornings, fresh recruits line up for an orientation intended to catapult them into Amazon’s singular way of working. They are told to forget the “poor habits” they learned at previous jobs, one employee recalled. When they “hit the wall” from the unrelenting pace, there is only one solution: “Climb the wall,” others reported. To be the best Amazonians they can be, they should be guided by the leadership principles, 14 rules inscribed on handy laminated cards. When quizzed days later, those with perfect scores earn a virtual award proclaiming, “I’m Peculiar” — the company’s proud phrase for overturning workplace conventions. Many of the newcomers filing in on Mondays may not be there in a few years. The company’s winners dream up innovations that they roll out to a quarter-billion customers and accrue small fortunes in soaring stock. Losers leave or are fired in annual cullings of the staff — “purposeful Darwinism,” one former Amazon human resources director said. Some workers who suffered from cancer, miscarriages and other personal crises said they had been evaluated unfairly or edged out rather than given time to recover. Even as the company tests delivery by drone and ways to restock toilet paper at the push of a bathroom button, it is conducting a little-known experiment in how far it can push white-collar workers, redrawing the boundaries of what is acceptable. The company, founded and still run by Jeff Bezos, rejects many of the popular management bromides that other corporations at least pay lip service to and has instead designed what many workers call an intricate machine propelling them to achieve Mr. Bezos’ ever-expanding ambitions. In interviews, some said they thrived at Amazon precisely because it pushed them past what they thought were their limits. Many employees are motivated by “thinking big and knowing that we haven’t scratched the surface on what’s out there to invent,” said Elisabeth Rommel, a retail executive who was one of those permitted to speak. Others who cycled in and out of the company said that what they learned in their brief stints helped their careers take off. And more than a few who fled said they later realized they had become addicted to Amazon’s way of working. “Organizations are turning up the dial, pushing their teams to do more for less money, either to keep up with the competition or just stay ahead of the executioner’s blade,” said Clay Parker Jones, a consultant who helps old-line businesses become more responsive to change. On a recent morning, as Amazon’s new hires waited to begin orientation, few of them seemed to appreciate the experiment in which they had enrolled. Only one, Keith Ketzle, a freckled Texan triathlete with an M.B.A., lit up with recognition, explaining how he left his old, lumbering company for a faster, grittier one. “Conflict brings about innovation,” he said. Amazon was supposed to give you back precious time by making shopping and spending painlessly simple. Apps on your smartphone were supposed to do the same for all manner of re-tooled on-demand services. What wonderful time-saving inventions! So, now you can live in the moment and make use of all this extra free time. It’s your time now. You’ve won it back and no one can take it away. And, what do you spend this newly earned free time doing? Well, you sit at home in your isolated cocoon, you shop for more things online, you download some more great apps that promise to bring even greater convenience, you interact less with real humans, and, best of all, you spend more time working. Welcome to your new dystopian nightmare, and it’s happening right now. Click. And by late afternoon on a Tuesday, they’re striding into the lobby at a just-get-me-home-goddammit clip, some with laptop bags slung over their shoulders, others carrying swank leather satchels. At the same time a second, temporary population streams into the building: the app-based meal delivery people hoisting thermal carrier bags and sacks. Green means Sprig. A huge M means Munchery. Down in the basement, Amazon Prime delivery people check in packages with the porter. The Instacart groceries are plunked straight into a walk-in fridge. This is a familiar scene. Five months ago I moved into a spartan apartment a few blocks away, where dozens of startups and thousands of tech workers live. Outside my building there’s always a phalanx of befuddled delivery guys who seem relieved when you walk out, so they can get in. Inside, the place is stuffed with the goodies they bring: Amazon Prime boxes sitting outside doors, evidence of the tangible, quotidian needs that are being serviced by the web. The humans who live there, though, I mostly never see. And even when I do, there seems to be a tacit agreement among residents to not talk to one another. I floated a few “hi’s” in the elevator when I first moved in, but in return I got the monosyllabic, no-eye-contact mumble. It was clear: Lady, this is not that kind of building. “Sweet,” Dungeons & Dragons says, grabbing the bag of food. The door clanks behind him. And that’s when I realized: the on-demand world isn’t about sharing at all. It’s about being served. This is an economy of shut-ins. We’re now deep into the bombastic buildout of the on-demand economy— with investment in the apps, platforms and services surging exponentially. Right now Americans buy nearly eight percent of all their retail goods online, though that seems a wild underestimate in the most congested, wired, time-strapped urban centers. Many services promote themselves as life-expanding?—?there to free up your time so you can spend it connecting with the people you care about, not standing at the post office with strangers. Rinse’s ad shows a couple chilling at a park, their laundry being washed by someone, somewhere beyond the picture’s frame. But plenty of the delivery companies are brutally honest that, actually, they never want you to leave home at all. Katherine van Ekert isn’t a shut-in, exactly, but there are only two things she ever has to run errands for any more: trash bags and saline solution. For those, she must leave her San Francisco apartment and walk two blocks to the drug store, “so woe is my life,” she tells me. (She realizes her dry humor about #firstworldproblems may not translate, and clarifies later: “Honestly, this is all tongue in cheek. We’re not spoiled brats.”) Everything else is done by app. Her husband’s office contracts with Washio. Groceries come from Instacart. “I live on Amazon,” she says, buying everything from curry leaves to a jogging suit for her dog, complete with hoodie. Traditional retailers look at retailing primarily as a marketing and customer acquisition and relationship problem. For Amazon, it’s more of an engineering and IT problem with solutions to be found in innovation and optimization. Why do some stores succeed while others fail? Retailers constantly struggle with this question, battling one another in ways that change with each generation. In the late 1800s, architects ruled. Successful merchants like Marshall Field created palaces of commerce that were so gorgeous shoppers rushed to come inside. In the early 1900s, mail order became the “killer app,” with Sears Roebuck leading the way. Toward the end of the 20th century, ultra-efficient suburban discounters like Target and Walmart conquered all. Now the tussles are fiercest in online retailing, where it’s hard to tell if anyone is winning. Retailers as big as Walmart and as small as Tweezerman.com all maintain their own websites, catering to an explosion of customer demand. Retail e-commerce sales expanded 15 percent in the U.S in 2012—seven times as fast as traditional retail. But price competition is relentless, and profit margins are thin to nonexistent. It’s easy to regard this $186 billion market as a poisoned prize: too big to ignore, too treacherous to pursue. Much of that investment goes straight into technology. To Amazon, retailing looks like a giant engineering problem. Algorithms define everything from the best way to arrange a digital storefront to the optimal way of shipping a package. Other big retailers spend heavily on advertising and hire a few hundred engineers to keep systems running. Amazon prefers a puny ad budget and a payroll packed with thousands of engineering graduates from the likes of MIT, Carnegie Mellon, and Caltech. Other big merchants are getting the message. Walmart, the world’s largest retailer, two years ago opened an R&D center in Silicon Valley where it develops its own search engines and looks for startups to buy. But competing on Amazon’s terms doesn’t stop with putting up a digital storefront or creating a mobile app. Walmart has gone as far as admitting that it may have to rethink what its stores are for. To equal Amazon’s flawless delivery, this year it even floated the idea of recruiting shoppers out of its aisles to play deliveryman, whisking goods to customers who’ve ordered online. Amazon is a tech innovator by necessity, too. The company lacks three of conventional retailing’s most basic elements: a showroom where customers can touch the wares; on-the-spot salespeople who can woo shoppers; and the means for customers to take possession of their goods the instant a sale is complete. In one sense, everything that Amazon’s engineers create is meant to make these fundamental deficits vanish from sight. Amazon’s cunning can be seen in the company’s growing patent portfolio. Since 1994, Amazon.com and a subsidiary, Amazon Technologies, have won 1,263 patents. (By contrast, Walmart has just 53.) Each Amazon invention is meant to make shopping on the site a little easier, a little more seductive, or to trim away costs. Consider U.S. Patent No. 8,261,983, on “generating customized packaging” which came into being in late 2012. “We constantly try to drive down the percentage of air that goes into a shipment,” explains Dave Clark, the Amazon vice president who oversees the company’s nearly 100 warehouses, known as fulfillment centers. The idea of shipping goods in a needlessly bulky box (and paying a few extra cents to United Parcel Service or other carriers) makes him shudder. Ship nearly a billion packages a year, and those pennies add up. 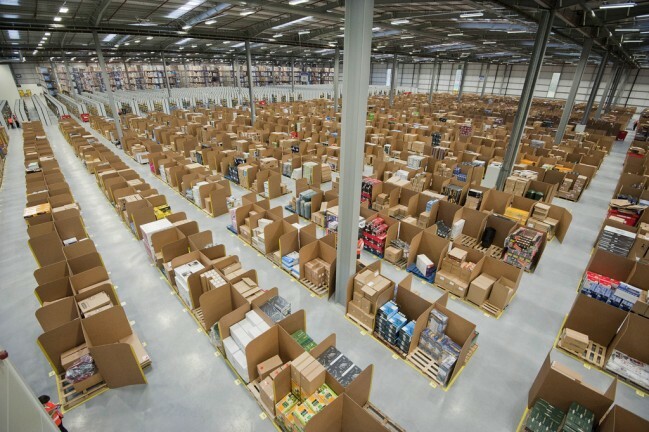 Amazon over the years has created more than 40 sizes of boxes– but even that isn’t enough. That’s the glory of Amazon’s packaging patent: when a customer’s odd pairing of items creates a one-of-a-kind shipment, Amazon now has systems that will compute the best way to pack that order and create a perfect box for it within 30 minutes. For thousands of online merchants, it’s easier to live within Amazon’s ecosystem than to compete. So small retailers such as EasyLunchboxes.com have moved their inventory into Amazon’s warehouses, where they pay a commission on each sale for shipping and other services. That is becoming a highly lucrative business for Amazon, says Goldman Sachs analyst Heath Terry. He predicts Amazon will reap $3.5 billion in cash flow from third-party shipping in 2014, creating a very profitable side business that he values at $38 billion—about 20 percent of the company’s overall stock market value. Jousting directly with Amazon is tougher. Researchers at Internet Retailer calculate that Amazon’s revenue exceeds that of its next 12 competitors combined. In a regulatory filing earlier this year, Target—the third-largest retailer in the U.S.—conceded that its “digital sales represented an immaterial amount of total sales.” For other online entrants, the most prudent strategies generally involve focusing on areas that the big guy hasn’t conquered yet, such as selling services, online “flash sales” that snare impulse buyers who can’t pass up a deal, or particularly challenging categories such as groceries. Yet many, if not most, of these upstarts are losing money. Image: Amazon fullfillment center, Scotland. Courtesy of Amazon / Wired. Soon courtesy of Amazon, Google and other retail giants, and of course lubricated by the likes of the ubiquitous UPS and Fedex trucks, you may be able to dispense with the weekly or even daily trip to the grocery store. Amazon is expanding a trial of its same-day grocery delivery service, and others are following suit in select local and regional tests. You may recall the spectacular implosion of the online grocery delivery service Webvan — a dot.com darling — that came and went in the blink of an internet eye, finally going bankrupt in 2001. Well, times have changed and now avaricious Amazon and its peers have their eyes trained on your groceries. So now all you need to do is find a service to deliver your kids to and from school, an employer who will let you work from home, convince your spouse that “staycations” are cool, use Google Street View to become a virtual tourist, and you will never, ever, ever, EVER need to leave your house again! The other day I ran out of toilet paper. You know how that goes. The last roll in the house sets off a ticking clock; depending on how many people you live with and their TP profligacy, you’re going to need to run to the store within a few hours, a day at the max, or you’re SOL. (Unless you’re a man who lives alone, in which case you can wait till the next equinox.) But it gets worse. My last roll of toilet paper happened to coincide with a shortage of paper towels, a severe run on diapers (you know, for kids! ), and the last load of dishwashing soap. It was a perfect storm of household need. And, as usual, I was busy and in no mood to go to the store. This quotidian catastrophe has a happy ending. In April, I got into the “pilot test” for Google Shopping Express, the search company’s effort to create an e-commerce service that delivers goods within a few hours of your order. The service, which is currently being offered in the San Francisco Bay Area, allows you to shop online at Target, Walgreens, Toys R Us, Office Depot, and several smaller, local stores, like Blue Bottle Coffee. Shopping Express combines most of those stores’ goods into a single interface, which means you can include all sorts of disparate items in the same purchase. Shopping Express also offers the same prices you’d find at the store. After you choose your items, you select a delivery window—something like “Anytime Today” or “Between 2 p.m. and 6 p.m.”—and you’re done. On the fateful day that I’d run out of toilet paper, I placed my order at around noon. Shortly after 4, a green-shirted Google delivery guy strode up to my door with my goods. I was back in business, and I never left the house. Google is reportedly thinking about charging $60 to $70 a year for the service, making it a competitor to Amazon’s Prime subscription plan. But at this point the company hasn’t finalized pricing, and during the trial period, the whole thing is free. I’ve found it easy to use, cheap, and reliable. Similar to my experience when I first got Amazon Prime, it has transformed how I think about shopping. In fact, in the short time I’ve been using it, Shopping Express has replaced Amazon as my go-to source for many household items. I used to buy toilet paper, paper towels, and diapers through Amazon’s Subscribe & Save plan, which offers deep discounts on bulk goods if you choose a regular delivery schedule. I like that plan when it works, but subscribing to items whose use is unpredictable—like diapers for a newborn—is tricky. I often either run out of my Subscribe & Save items before my next delivery, or I get a new delivery while I still have a big load of the old stuff. Shopping Express is far simpler. You get access to low-priced big-box-store goods without all the hassle of big-box stores—driving, parking, waiting in line. And you get all the items you want immediately. After using it for a few weeks, it’s hard to escape the notion that a service like Shopping Express represents the future of shopping. (Also the past of shopping—the return of profitless late-1990s’ services like Kozmo and WebVan, though presumably with some way of making money this time.) It’s not just Google: Yesterday, Reuters reported that Amazon is expanding AmazonFresh, its grocery delivery service, to big cities beyond Seattle, where it has been running for several years. Amazon’s move confirms the theory I floated a year ago, that the e-commerce giant’s long-term goal is to make same-day shipping the norm for most of its customers. Amazon’s main competitive disadvantage, today, is shipping delays. While shopping online makes sense for many purchases, the vast majority of the world’s retail commerce involves stuff like toilet paper and dishwashing soap—items that people need (or think they need) immediately. That explains why Wal-Mart sells half a trillion dollars worth of goods every year, and Amazon sells only $61 billion. Wal-Mart’s customers return several times a week to buy what they need for dinner, and while they’re there, they sometimes pick up higher-margin stuff, too. By offering same-day delivery on groceries and household items, Amazon and Google are trying to edge in on that market. As I learned while using Shopping Express, the plan could be a hit. If done well, same-day shipping erases the distinctions between the kinds of goods we buy online and those we buy offline. Today, when you think of something you need, you have to go through a mental checklist: Do I need it now? Can it wait two days? Is it worth driving for? With same-day shipping, you don’t have to do that. All shopping becomes online shopping. Image: Webvan truck. Courtesy of Wikipedia. In another sign of Amazon’s unquenchable thirst for all things commerce, the company is now moving more aggressively into publishing. 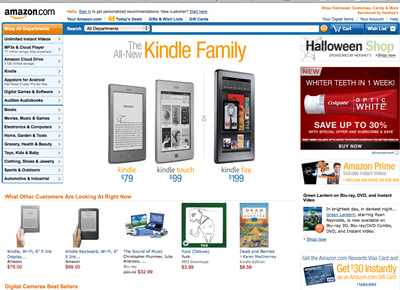 Amazon will publish 122 books this fall in an array of genres, in both physical and e-book form. It is a striking acceleration of the retailer’s fledging publishing program that will place Amazon squarely in competition with the New York houses that are also its most prominent suppliers. It has set up a flagship line run by a publishing veteran, Laurence Kirshbaum, to bring out brand-name fiction and nonfiction. It signed its first deal with the self-help author Tim Ferriss. Last week it announced a memoir by the actress and director Penny Marshall, for which it paid $800,000, a person with direct knowledge of the deal said. Publishers say Amazon is aggressively wooing some of their top authors. And the company is gnawing away at the services that publishers, critics and agents used to provide. Several large publishers declined to speak on the record about Amazon’s efforts. “Publishers are terrified and don’t know what to do,” said Dennis Loy Johnson of Melville House, who is known for speaking his mind. “Everyone’s afraid of Amazon,” said Richard Curtis, a longtime agent who is also an e-book publisher. “If you’re a bookstore, Amazon has been in competition with you for some time. If you’re a publisher, one day you wake up and Amazon is competing with you too. And if you’re an agent, Amazon may be stealing your lunch because it is offering authors the opportunity to publish directly and cut you out.